. Click for a pdf file of this page with better formatting and graphs that look better when printed. Get help if you have trouble answering these questions. An attempt is not enough. On the due date or before, you will show this to me and keep it. I will give you credit and the right to take the mastery test. You will then look at the solutions in a notebook -not online. These problems do not need to go into your bound solutions book with your classwork and homework problems. You are allowed to work with anyone else you wish to work with. Working with a friend who did well on the test is a GREAT IDEA. 1. What is the instantaneous velocity at 2.5 min? 2. 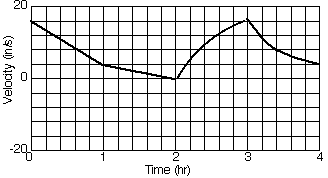 Which single minute time interval show a positive displacement? 3. What is the displacement from 1 to 2 minutes? 4. 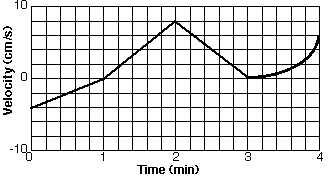 Which single minute time interval shows an acceleration -positive or negative? 5. 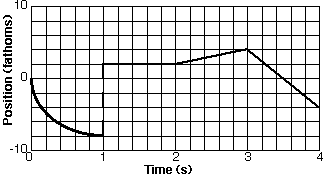 Which single minute time interval(s) show a negative velocity? 6. Which single minute time interval(s) show a negative jerk? 7. Which single minute time interval(s) show a positive jerk? 8. Which single minute time interval(s) shows a positive velocity and a negative acceleration? 9. Which single second time interval(s) contains a positive acceleration? 10. Which single second time interval(s) contains a negative velocity? 11. What is the instantaneous velocity at 2.5 seconds? 12. Which single second time interval(s) contains a velocity of zero? 13. 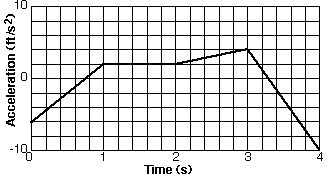 If this graph showed the motion of a person's movement, where is the person standing still? 15. 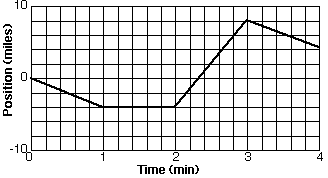 Which single minute time interval(s) contains a positive acceleration? 16. Which single minute time interval(s) contains a negative velocity? 17. What is the instantaneous velocity at 2.5 minutes? 18. Which single minute time interval(s) contains a velocity of zero? 19. Which single second time interval(s) contain positive acceleration and a negative jerk somewhere in the time interval? 20. Which single second time interval(s) contain a jerk of zero? 21. 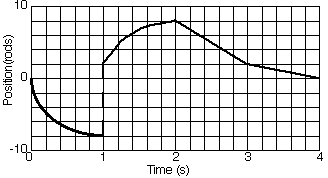 Which single second time interval(s) contain a negative acceleration and a positive jerk? 22. Which single hour time interval(s) contains a positive acceleration and a negative velocity? 23. What is the velocity at 2.546 hours? 24. Which single hour time interval(s) contains a velocity of zero? 25. Which single hour time interval(s) contains a negative acceleration? 26. What is the acceleration at 0.60 hours? 27. What is the velocity at 1 hour? 28. What is the acceleration at 2.6 hours? 29. Which single hour time interval(s) contains a positive velocity and a negative acceleration? 30. Where is the velocity zero? 31. What is the displacement from 2 to 4 seconds? 32. Where are the single second displacements negative? 33. What is the velocity at 3.6 seconds? 34. What is the velocity at 0.4 seconds? 35. If this graph represented the motion of a car, where is the car moving backwards the fastest? What are the units for the slope on the graphs from the first 4 pages of this assignment? 46. 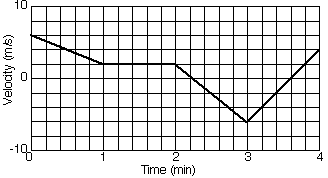 Which single minute time interval contains a negative displacement? 47. Which single minute time interval shows a velocity of zero? 48. 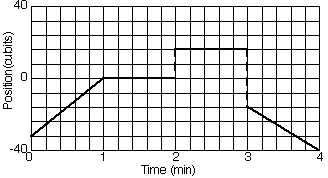 Which single minute time interval shows a displacement of zero? 49. Which single minute time a positive velocity and zero displacement? 50. 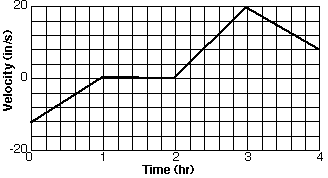 Why is there a vertical dotted line on this graph at 3 seconds?